In business for over 25 years, Faith Auto Glass & Tinting is one of the most trusted providers of windshield replacement in Riverside County. As a testament to the exceptional quality of our work, excellent customer service, and competitive prices, we have tens of thousands of satisfied clients across Temecula, Hemet, Wildomar, Menifee, Murrieta, Fallbrook, Sun City, Palma, and surrounding areas and consistently receive five-star reviews on Yelp. 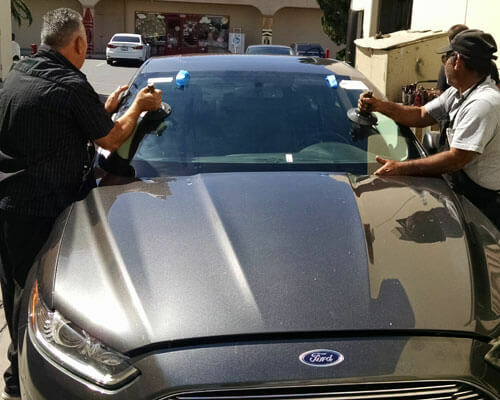 We have some of the most experienced auto glass installers in Riverside County (averaging 15 to 30 years each) who have been trained and certified by Dow Automotive Systems, the car industry's preferred manufacturer of urethane adhesives. To ensure every completed windshield replacement looks like new and delivers the same level of protection as it did prior to replacement, we use the industry's best materials and installation practices. Dow Urethane Trained & Certified. Large Inventory of Windshield Glass. Insurance Approved. Call us today for a free estimate on windshield replacement. The cost to replace your windshield will depend largely on the model of your vehicle and whether you opt for original equipment manufacturer (OEM) or original equipment equivalent (OEE) glass, 24-hour or 1-hour urethane adhesive, and whether you want any special add-on features, such as tinting. We keep thousands of premium-quality windshields in stock to accommodate all makes and models of vehicles, from popular brands such as Toyota, Ford, and Mazda to high-end cars such as BMW, Mercedes, Ferrari, and Lamborghini. 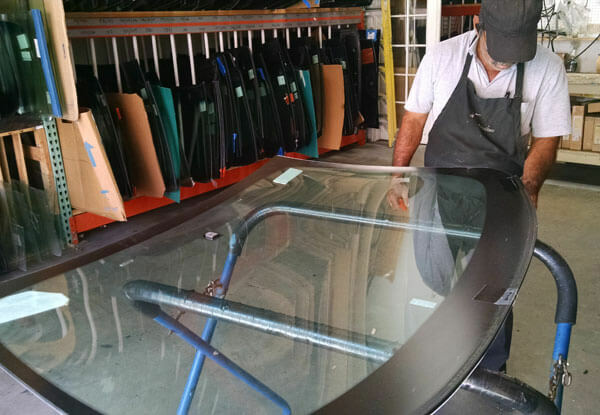 Because we continuously maintain a large inventory of windshields and other auto glass, we are able to provide a quick turnaround time on service and pass on the significant discounts we get for buying in bulk to our customers. We're also prepared to meet the needs of those with the latest models of high-tech cars; we can replace windshields with rain sensors, warning signals, cameras, and other advanced features. In addition to using OEM or OEM-equivalent windshield glass and the industry's leading adhesives, we also strictly adhere to OEM-approved auto glass replacement methods to give our customers windshield replacement services of the highest quality. After the windshield is installed, depending upon which adhesive you choose, your windshield will need to dry for either one hour or 24 hours. Once fully dry, your car will be safe to drive and its windshield will not only look like new, but also be as strong as when it first came off the assembly line. All of our windshield replacements are backed by our lifetime labor warranty. Call Faith Auto Glass & Tinting today for the very best in auto glass replacement. We are licensed and insured, and perform all windshield replacements to meet or exceed the standards set by the California Bureau of Automotive Repair. We're approved by all major insurance companies and can help you save money on your deductible. We welcome appointments and walk-ins Monday through Saturday, from 8am to 5pm, and provide mobile services throughout Murrieta, Menifee, Hemet, Wildomar, Palma, Winchester, Fallbrook, and Temecula. Call for quote. We accept cash and credit cards. Seriously the best place to take your car for tinting and windshield services. Had a rock chip my windshield which turned into a HUGE crack and of course, no hesitation, thought I'm bringing it to Faith. I called them on Thursday afternoon, they ordered the windshield . . .
We provide expert windshield replacement services in Temecula, CA. At Faith Auto Glass you're guaranteed to receive excellent results at competitive rates. We stand behind the quality of our work with a lifetime labor warranty.